Mathieu van der Poel has already been tearing up the World Cup circuit on the new Canyon Lux. Efficiency will always be the highest value currency in XC racing. The lighter your setup, the faster you’ll climb. But what goes up must come down. Whether tackling technical World Cup singletrack or long stretches of washboard dirt at the Cape Epic, the rise of the lightweight full suspension setup has helped racers press home their advantage even after the climbing is done. The new 100mm flat shock configuration and heavily revised suspension linkage have been tuned to boost traction up loose climbs. 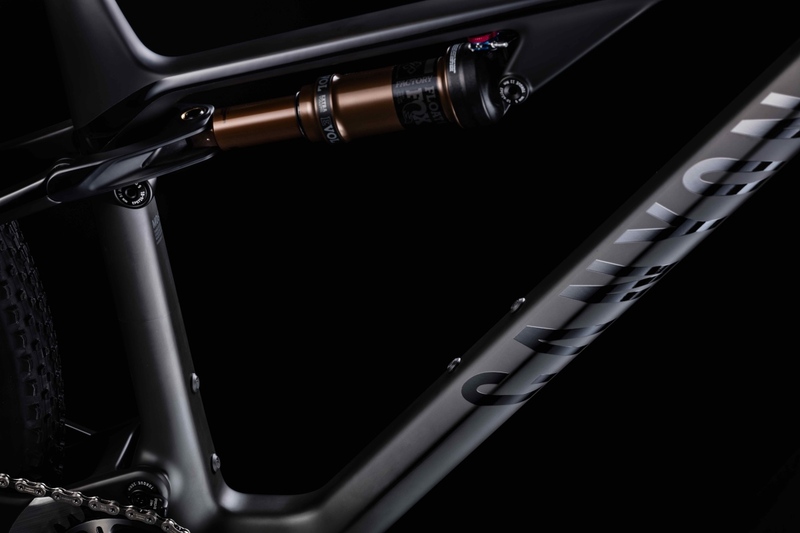 With the new Lux, Canyon engineers set out to build on the success of its. Chief among their development objectives was an ambitious sub-2000g target for frame and shock, as well as providing space for two large 800ml water bottles across all frame sizes. 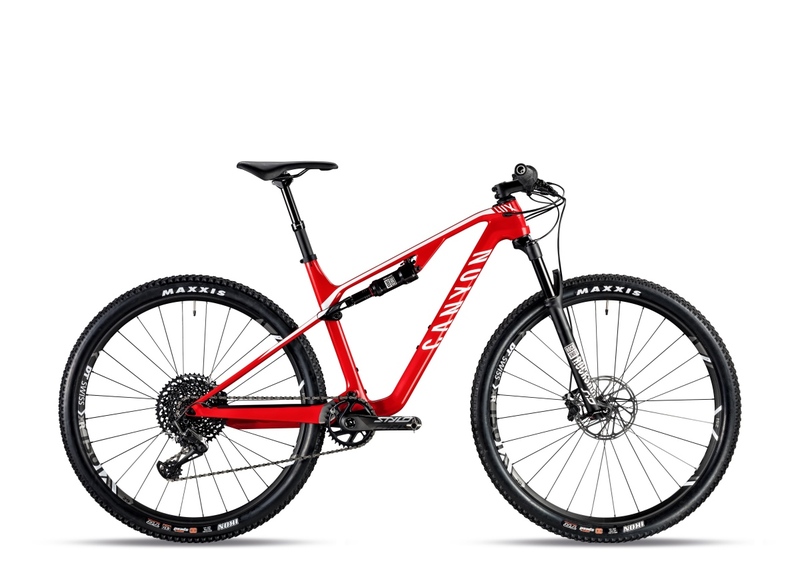 Additionally, the new 100 mm flat shock configuration and heavily revised suspension linkage have been tuned to not only boost traction up loose climbs, but also make the bike far more capable over rough and technical terrain. Suspension travel is either 100mm or 110mm depending on model. Even in prototype phase the new Lux got off to a winning start at the 2018 ABSA Cape Epic with a stage victory under Alban Lakata and Kristian Hynek. Over on the World Cup circuit, the bike has also accompanied Pauline Ferrand-Prévot and Mathieu van der Poel on multiple visits to the podium with the bulk of the season still to be raced. 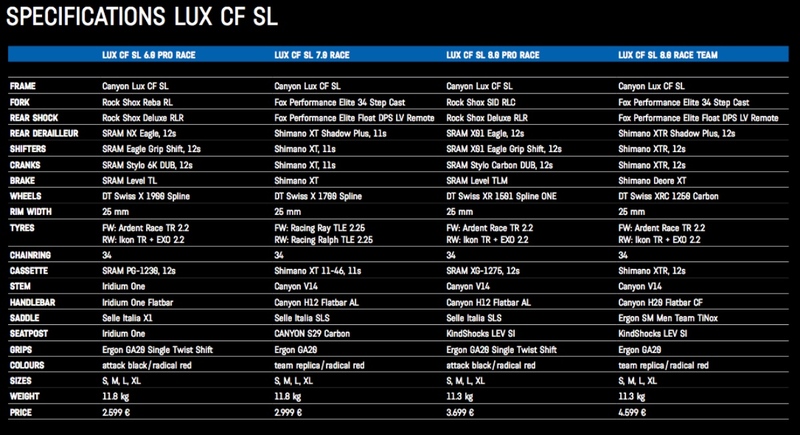 The new Lux CF SL 8.0 Pro Race sells for under $4300. A total of six models across two frame platforms make up the Lux range, enabling riders from weekend warriors to the most committed campaigners to find the right model for them. Two Lux CF SL models starting at $2999 come equipped with 110 mm travel up-front, while two flagship Lux CF SLX models feature 100 mm forks to reflect their superlight nature. 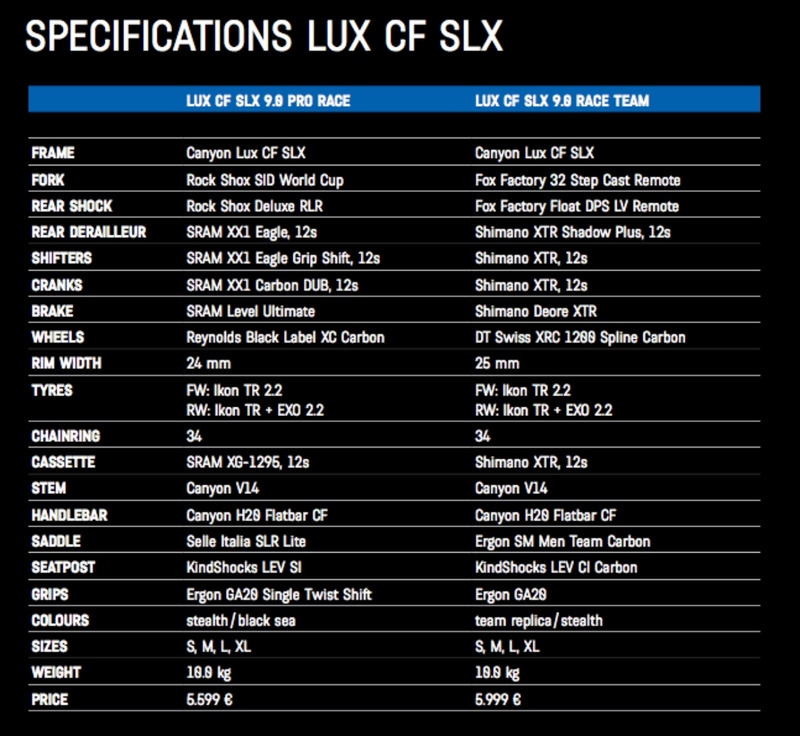 The Lux CF SLX will also be available as a frameset option, including shock. All bikes, barring the base CF SL models, come equipped with dropper posts, so they are ready for the demands of modern XC racing. 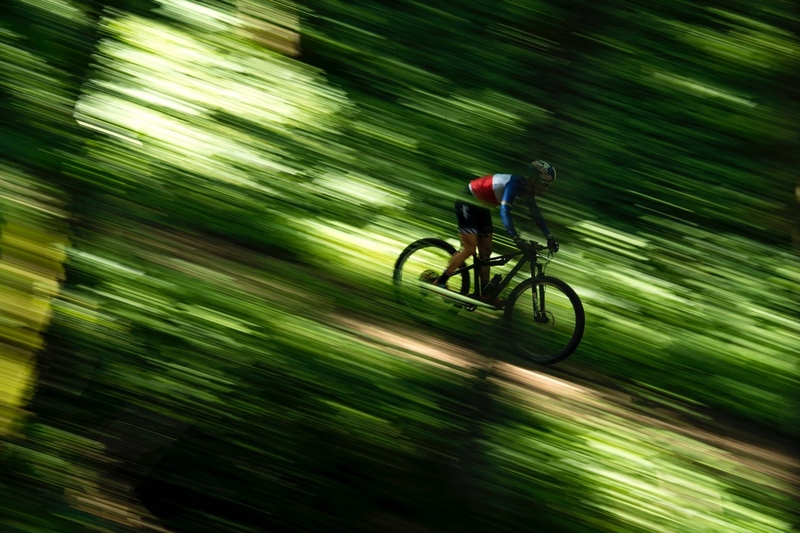 The Lux CF SLX 9.0 Race Team is ready for World Cup racing or whatever adventure you have in mind. 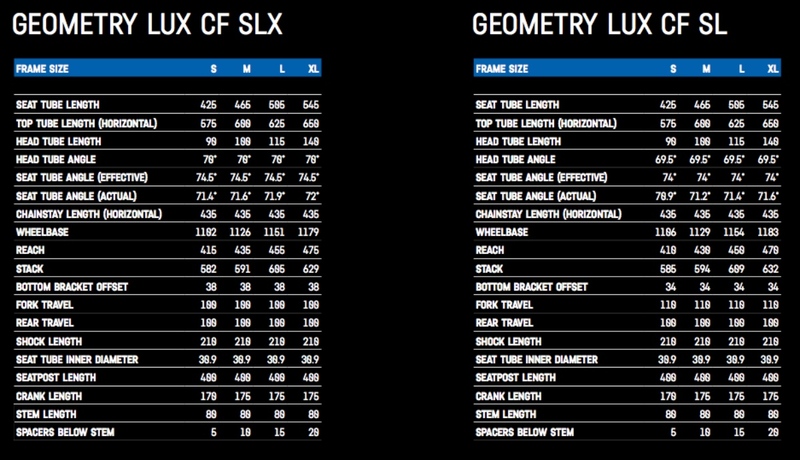 Here is full spec and geometry charts for all the new Canyon Lux builds. Click the image to enlarge. The all-new Lux is available now. To find out more, go to www.canyon.com.